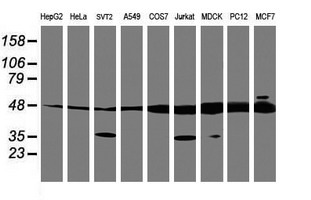 Western Blot analysis of TUBAL3 expression in transfected 293T cell line (H00079861-T01) by TUBAL3 MaxPab polyclonal antibody.Lane 1: TUBAL3 transfected lysate(44.66 KDa).Lane 2: Non-transfected lysate. 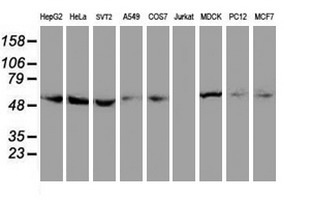 Western Blot analysis of TUBAL3 expression in transfected 293T cell line (H00079861-T02) by TUBAL3 MaxPab polyclonal antibody.Lane 1: TUBAL3 transfected lysate(45.50 KDa).Lane 2: Non-transfected lysate. 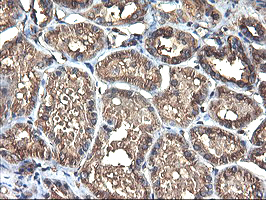 Immunoprecipitation of TUBAL3 transfected lysate using anti-TUBAL3 MaxPab rabbit polyclonal antibody and Protein A Magnetic Bead (U0007), and immunoblotted with TUBAL3 MaxPab mouse polyclonal antibody (B01) (H00079861-B01). 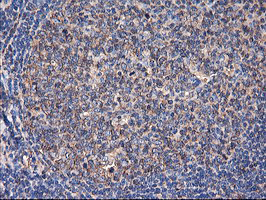 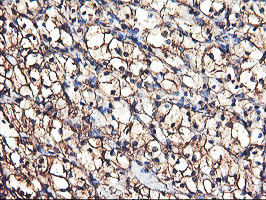 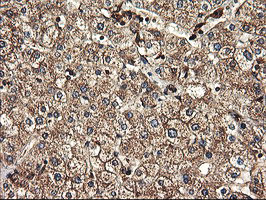 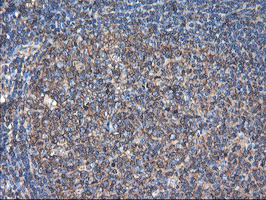 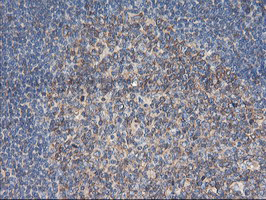 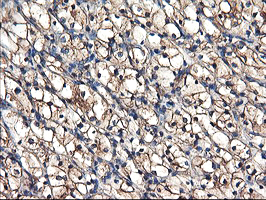 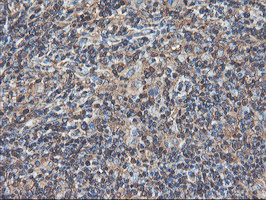 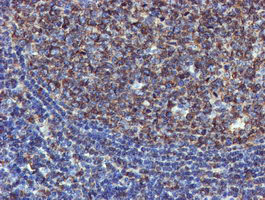 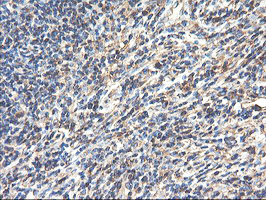 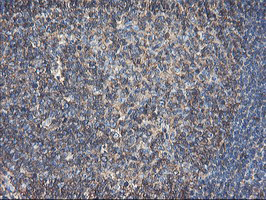 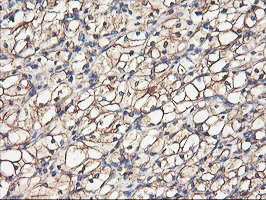 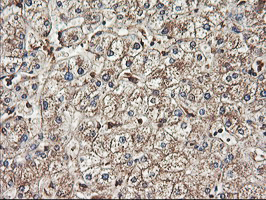 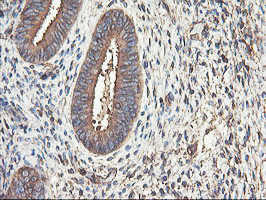 Anti-TUBAL3 mouse monoclonal antibody (TA503906) immunofluorescent staining of COS7 cells transiently transfected by pCMV6-ENTRY TUBAL3(RC216194). 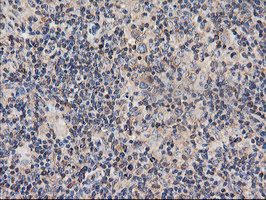 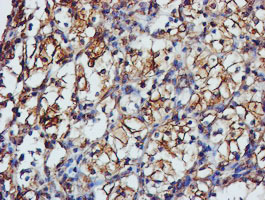 HEK293T cells were transfected with the pCMV6-ENTRY control (Left lane) or pCMV6-ENTRY TUBAL3 (RC216194, Right lane) cDNA for 48 hrs and lysed. 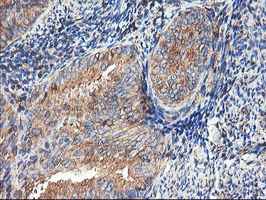 Equivalent amounts of cell lysates (5 ug per lane) were separated by SDS-PAGE and immunoblotted with anti-TUBAL3. 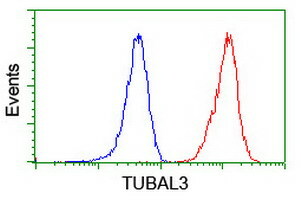 Flow cytometric Analysis of Jurkat cells, using anti-TUBAL3 antibody(TA503906),(Red), compared to a nonspecific negative control antibody,(Blue). 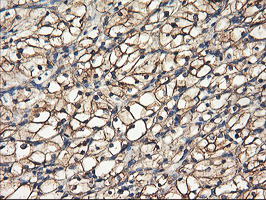 Anti-TUBAL3 mouse monoclonal antibody (TA503907) immunofluorescent staining of COS7 cells transiently transfected by pCMV6-ENTRY TUBAL3(RC216194). Flow cytometric Analysis of Jurkat cells, using anti-TUBAL3 antibody(TA503907),(Red), compared to a nonspecific negative control antibody,(Blue). 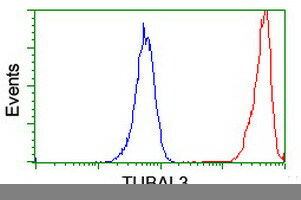 HEK293T cells transfected with either RC216194 overexpress plasmid(Red) or empty vector control plasmid(Blue) were immunostained by anti-TUBAL3 antibody(TA503907), and then analyzed by flow cytometry. 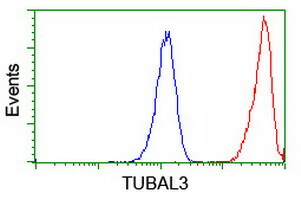 Flow cytometric Analysis of Hela cells, using anti-TUBAL3 antibody(TA503907),(Red), compared to a nonspecific negative control antibody,(Blue). 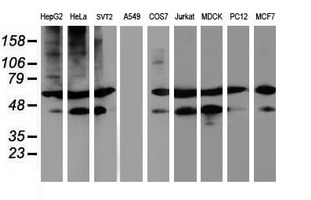 Western blot analysis of extracts (35ug) from 9 different cell lines by using anti-TUBAL3 monoclonal antibody. 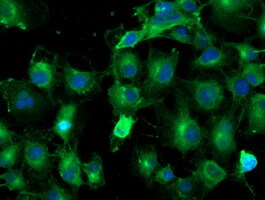 HEK293T cells transfected with either RC216194 overexpress plasmid(Red) or empty vector control plasmid(Blue) were immunostained by anti-TUBAL3 antibody(TA503908), and then analyzed by flow cytometry. 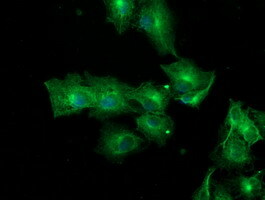 Anti-TUBAL3 mouse monoclonal antibody (TA503909) immunofluorescent staining of COS7 cells transiently transfected by pCMV6-ENTRY TUBAL3(RC216194). 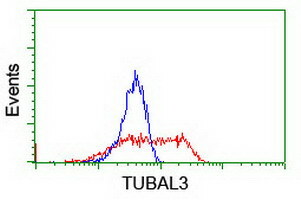 Flow cytometric Analysis of Hela cells, using anti-TUBAL3 antibody(TA503909),(Red), compared to a nonspecific negative control antibody,(Blue). 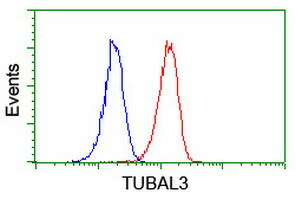 Flow cytometric Analysis of Jurkat cells, using anti-TUBAL3 antibody(TA503909),(Red), compared to a nonspecific negative control antibody,(Blue). 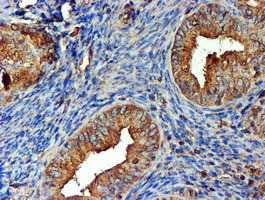 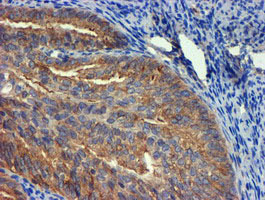 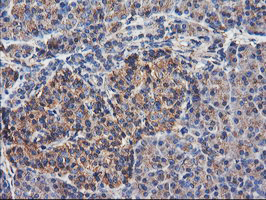 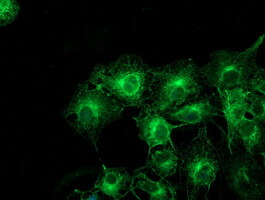 Anti-TUBAL3 mouse monoclonal antibody (TA503911) immunofluorescent staining of COS7 cells transiently transfected by pCMV6-ENTRY TUBAL3(RC216194). 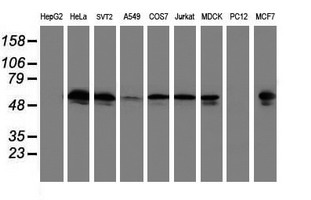 Western blot analysis of extracts (35ug) from 9 different cell lines by using anti-TUBAL3 monoclonal antibody (HepG2: human; HeLa: human; SVT2: mouse; A549: human; COS7: monkey; Jurkat: human; MDCK: canine; PC12: rat; MCF7: human). 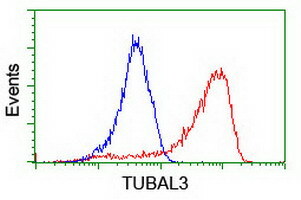 HEK293T cells transfected with either RC216194 overexpress plasmid(Red) or empty vector control plasmid(Blue) were immunostained by anti-TUBAL3 antibody(TA503924), and then analyzed by flow cytometry. 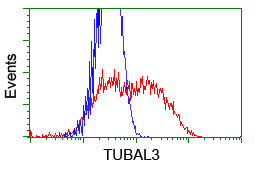 Flow cytometric Analysis of Jurkat cells, using anti-TUBAL3 antibody(TA503924),(Red), compared to a nonspecific negative control antibody,(Blue). 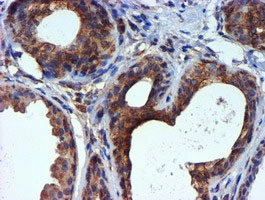 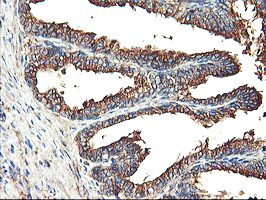 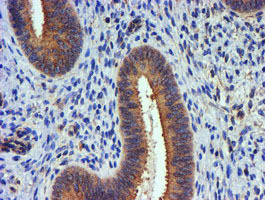 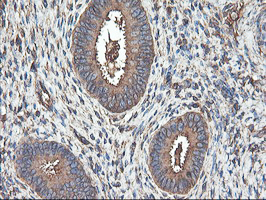 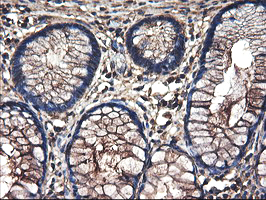 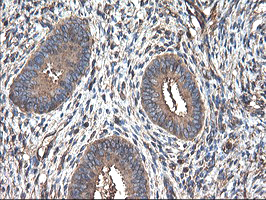 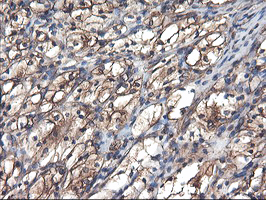 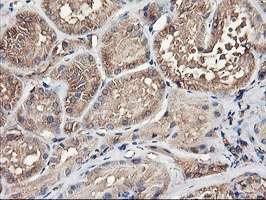 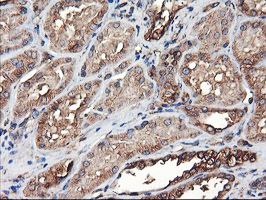 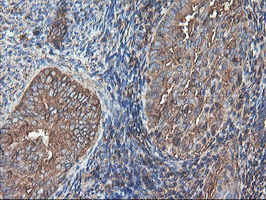 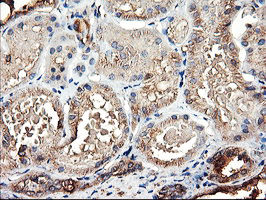 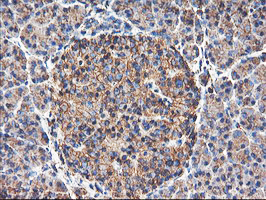 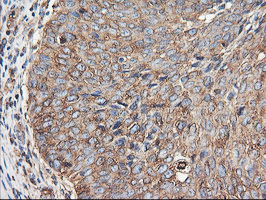 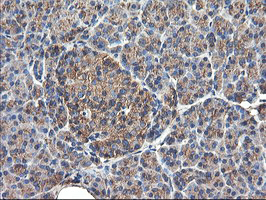 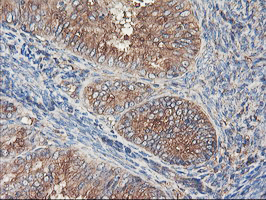 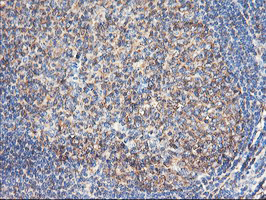 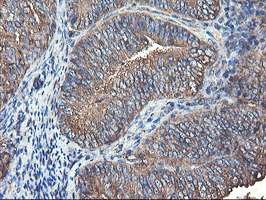 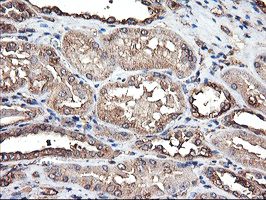 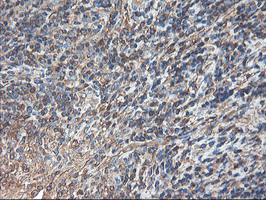 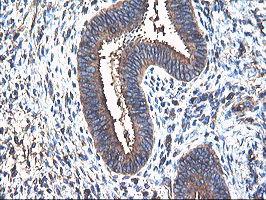 Anti-TUBAL3 mouse monoclonal antibody (TA503931) immunofluorescent staining of COS7 cells transiently transfected by pCMV6-ENTRY TUBAL3(RC216194). 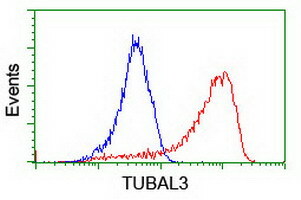 HEK293T cells transfected with either RC216194 overexpress plasmid(Red) or empty vector control plasmid(Blue) were immunostained by anti-TUBAL3 antibody(TA503931), and then analyzed by flow cytometry. 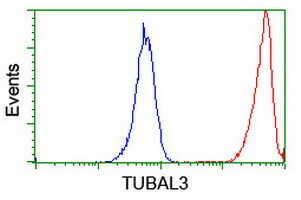 Flow cytometric Analysis of Jurkat cells, using anti-TUBAL3 antibody(TA503931),(Red), compared to a nonspecific negative control antibody,(Blue). 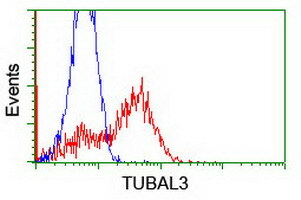 Flow cytometric Analysis of Hela cells, using anti-TUBAL3 antibody(TA503931),(Red), compared to a nonspecific negative control antibody,(Blue). 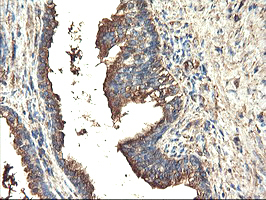 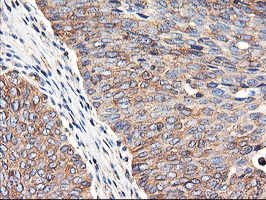 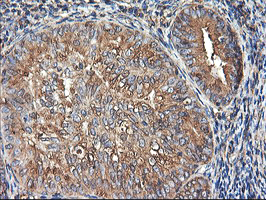 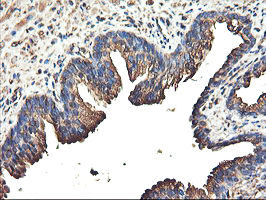 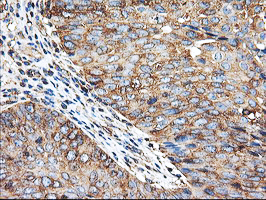 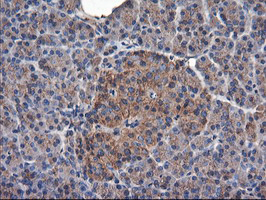 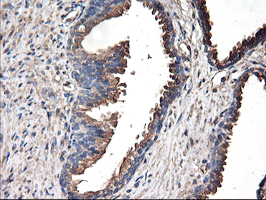 Anti-TUBAL3 mouse monoclonal antibody (TA503932) immunofluorescent staining of COS7 cells transiently transfected by pCMV6-ENTRY TUBAL3(RC216194). HEK293T cells transfected with either RC216194 overexpress plasmid(Red) or empty vector control plasmid(Blue) were immunostained by anti-TUBAL3 antibody(TA503932), and then analyzed by flow cytometry. 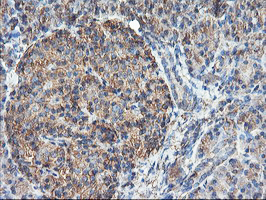 Anti-TUBAL3 mouse monoclonal antibody (TA503938) immunofluorescent staining of COS7 cells transiently transfected by pCMV6-ENTRY TUBAL3(RC216194). 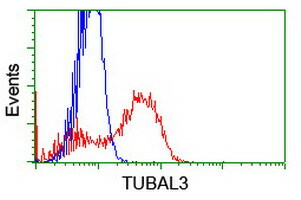 Flow cytometric Analysis of Hela cells, using anti-TUBAL3 antibody(TA503938),(Red), compared to a nonspecific negative control antibody,(Blue). 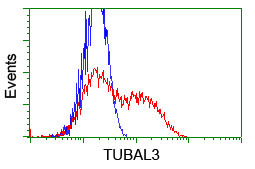 Flow cytometric Analysis of Jurkat cells, using anti-TUBAL3 antibody(TA503938),(Red), compared to a nonspecific negative control antibody,(Blue). 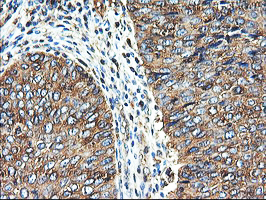 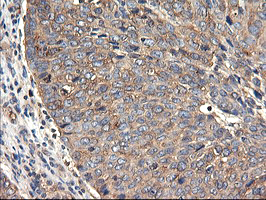 Anti-TUBAL3 mouse monoclonal antibody (TA503939) immunofluorescent staining of COS7 cells transiently transfected by pCMV6-ENTRY TUBAL3(RC216194). Flow cytometric Analysis of Hela cells, using anti-TUBAL3 antibody(TA503939),(Red), compared to a nonspecific negative control antibody,(Blue). 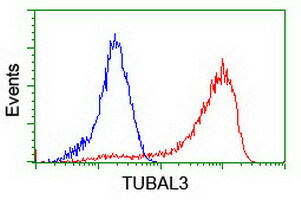 Flow cytometric Analysis of Jurkat cells, using anti-TUBAL3 antibody(TA503939),(Red), compared to a nonspecific negative control antibody,(Blue). 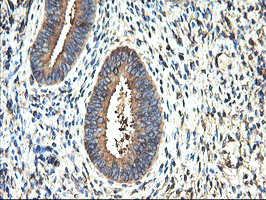 13 products - FILTER YOUR RESULTS!